“1. Happy customers are your best advertising. Make people happy. customers. They will do your marketing for you, for free. 4. UR the UE: You are the user experience (not what your ads say you are). 7. Be interesting or be invisible. Let’s make sure you’ve got a WOMM plan embedded in your coming PR activities. It is cheap, mostly effective, but terribly difficult to ramp up. Who are the individuals you’re targeting? How do you approach them without sounding too much biased? How do you recognize them? With what stories and messages do you nurture them? All these questions need to be addressed prior initiating your WOMM as WOMM is Marketing 2.0 lethal weapon. It is the right time of the year to take a look back at what we thought were going to be the trends for this ending year. McKinsey is doing it in a number of areas — read Ten trends to watch in 2006 for all of it — but one of them caught my attention as we discussed it many times in Marketing 2.0 — check User Generated Content label and on Marketing 2.0. Capitalizing on customer insights is probably the one dimension that gave Marketing in the web 2.0 era, a.k.a. Marketing 2.0, a clear paradigm shift. Read McKinsey Capitalizing on customer insights article about it. As McKinsey points out, we need to embed customer insights in the organization’s key decisions from sales planning to marketing investment. It cannot remain anymore an isolated research belonging to a specific division within our marketing department. When considering on-line marketing and customer engagement, it even becomes a real-time discipline. Yes, Marketing 2.0 is to be managed real-time, leading to a real-time business adaptation. No need here to even remind you about these newly created companies betting their full business model on this user generated content (Flickr, YouTube, …). Capitalizing on customer insights is no longer “nice to have” but clearly moved in the “must have” category for all of our businesses. Buzz words can be true enemies. When I talk about Web 2.0, sometimes at length, a lot of debating takes place on a number of topics before I finally ask: “But what does Web 2.0 mean to you?“. Let me save you the clueless faces and the typical “you know, web 2.0” reinforced by a supposedly mutual understanding face. Very often though, I hear AJAX and rich web client interfaces are the underpinning revolution attached to Web 2.0. Well, all of this is true. Let’s refer to Tim O’Reilly’s definition of Web 2.0, as he coined the term back in Sept. 2005. In the Web 2.0 world, the web is a platform not a destination. Thus Tim elaborates with this Netscape vs. Google comparison to support his claim. Netscape flagship product was a web browser i.e. a desktop application, Google flagship product is a web service. You can refer to Jay’s interview if you read french. Here it is. Web 2.0 for us marketers is an acceleration of empowered customers and consumers two ways communicating with our brands and among themselves. Be sure to capture this inter-customer communication not to avoid growing negative buzz, as we highlighted here in Marketing 2.0 for Dell. To me, Web 2.0 is the today’s answer to the non effective advertising cloud addressing ad-educated populations. In a way, it drives us to being positioned properly and relevant to prospect audiences and to lead with transparency in our communication. This is another chapter of our Marketing 2.0 Manifesto. I was attending yesterday a comprehensive conference in Paris about e-commerce, looking for a solid update on e-marketing techniques. All major players in the on-line industry were represented – Yahoo, eBay, Google, and Microsoft – and the Internet Advertising Bureau (IAB) shared with us the latest development of on-line consumers behavior. To let you discover how passionate these individuals were, I’m sharing with you one of the snapshots I took during the keynote. No obvious passion right? I was expecting some breaking announcement about Web 2.0 related new techniques, even some marketing 2.0 concepts to flourish. 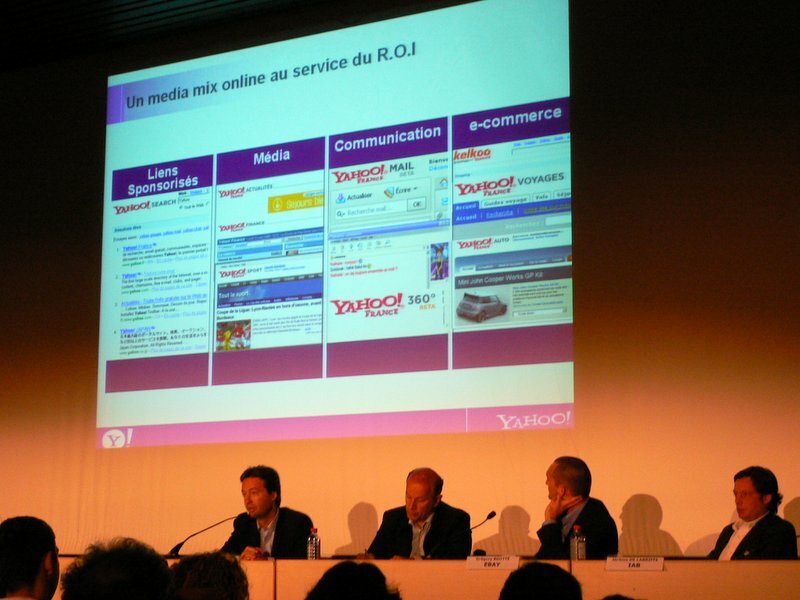 Not only was I disappointed but furthermore, Yahoo’s France General Manager just told us how he thought Web 2.0 was just a fad, no new news here he said. He referred to a Tim Berners-Lee statement to explain that he would call it Internet t.c, t.c. meaning “tout court”, which would translate as something like “Internet period” as Tim defined the Internet as a way for individuals to communicate. Wow! I don’t know how much corporate folks at Yahoo would appreciate it. During the breakout sessions about sponsored links, I even heard professional marketers, especially from the major TV network in France, take some distance with blogging, coining it to a private non influential activity. I had to ask if he was afraid of blogs regarding his advertising business. You don’t want to hear his corporate answer, believe me. Fellow marketers, this is really the time for a marketing 2.0 manifesto to avoid for these wandering executives to ignore the paradigm shift we clearly are going through. As it always does during such eras — read Innovator’s Dilemma if you didn’t already — incumbents are trying to deny or ignore reality. This usually is announcing their business model fade if not their company’s. As a result, brilliant and dynamic small companies are becoming the new category gorillas. All these individuals might have missed this very interesting venture at spiceworks, providing an IT Management Software for … FREE! What is their business model? They let you install and use their solution for free, recouping on sponsored links clicks– especially Google’s –. Yes: advertising is now funding software. They have attracted more than 5,000 companies since launch on July 31st. Read this for more. And this is not isolated, as Universal recently announced music was going to be free as advertising was funding it as well. Universal is backing SpiralFrog, a start-up we already mentioned before here. Bite Marketing 2.0 before it bites you! Marketing 2.0 manifesto early draft? — Respond to happy customers, even adding a small gift to positive reviewers. — Encourage your customers to post reviews by mentioning these reviews to your regular customers. — The jury’s out on incentives. Offer a rebate to reviewers, whether positive or negative, for their next purchase. — Use positive reviews in your marketing, just like Zagat’s write-up found on restaurants front window.